Confederation of African Football (Caf) president Ahmad has yet to respond to Musa Bility's latest claims. Caf President Ahmad is facing a threat to his reign after being accused of violating the statutes of African football's ruling body. Executive Committee (ExCo) member Musa Bility called for an urgent ExCo meeting on Friday. He wants Ahmad's decisions to redistribute the 2021, 2023 and 2025 Africa Cup of Nations and sign a commercial deal without ExCo approval to be assessed. "It is my fervent hope that you will (agree) to investigate these matters of gross statutory and financial procedural violations by the President for appropriate actions," said Bility. "I defer to you to take the appropriate actions to save the increasing decline of our statutory governance system by exerting your authorities given you by the Caf Statutes," the Liberian wrote in a letter to his fellow ExCo members on 8 February. Caf's statutes rule that only eight of the ExCo's 23 members need to be present for such a meeting to go ahead. Should the ExCo find Ahmad guilty of breaching Caf statutes, which state that moving any Nations Cup requires the approval of the ExCo, the former Madagascar FA president could be suspended from his role and, ultimately, expelled. The BBC has contacted Caf for comment from Ahmad but has yet to hear back. 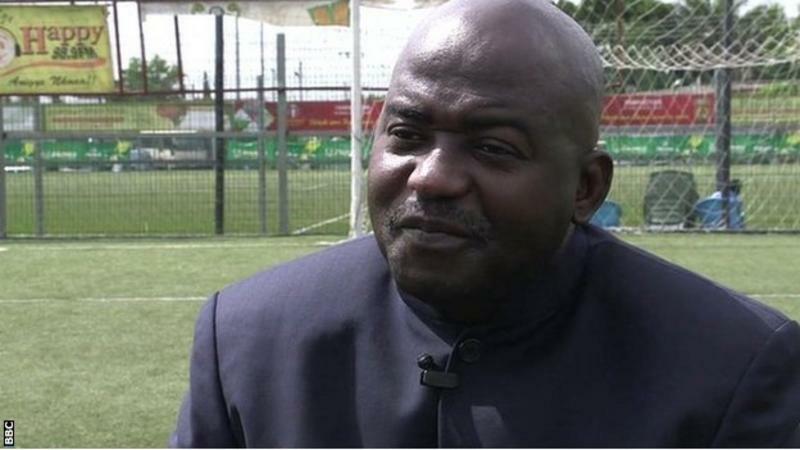 Musa Bility of Liberia has resigned from two committees within Caf which, as yet, has not responded to his comments. Bility maintains that the Malagasy violated Caf statutes when choosing to reassign hosting rights for three Nations Cups without ExCo approval. Shortly after Cameroon was stripped of hosting the 2019 edition in November because of slow preparations, Ahmad offered the same country the chance to stage the 2021 finals - which Ivory Coast had been set to stage. The Caf president revealed the offer on 3 December, prompting Ivory Coast to launch a legal challenge with the Court of Arbitration for Sport just days later before Caf itself issued a statement to say that no decision had been made with regard to changing the 2021 hosts. "We confirm no decision was taken by the executive committee," the African body stated on 17 December. Cameroon eventually accepted to host the 2021 finals, with Ivory Coast then agreeing to stage the 2023 edition (instead of 2021) and Guinea also choosing to stage two years later (2025 instead of 2021. Yet Ahmad's ability to re-order the competitions has not impressed Bility, who has also taken issue with the recently-announced partnership deal between Caf and betting company 1XBET. "Again, contrary to Caf Statutes, the signing of such a major sponsorship deal with a huge financial and regulatory implication without the approval of the Caf Executive Committee is a serious violation," Bility wrote. Last week, the former Liberian FA president resigned from two positions with Caf as he launched an initial attack on Ahmad's leadership. Ironically, the Liberian played a key role in Ahmad's election in 2017, when the Malagasy dethroned long-standing Caf president Issa Hayatou. However, as Bility's recent statements have made clear, there are clear divisions among those leading the African game. Caf's first vice-president Amaju Pinnick acknowledged the differences earlier this month. "When you start at an organisation which has been in the hands of someone for 29 years, you are definitely going to see things like this. Change is very difficult," Pinnick told BBC Sport. "We are doing everything to reduce those cracks. We're doing everything." Ahmad's term of office is set to expire in 2021.